Wilkommen! Let’s Celebrate Oktoberfest.What better way to celebrate Oktoberfest than with Brats and Beer. 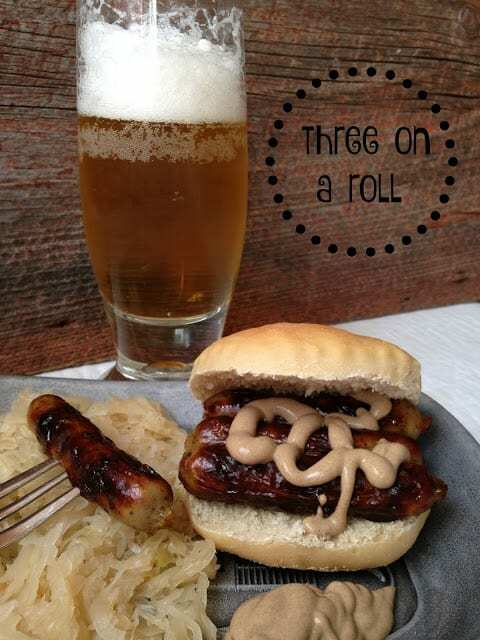 Today we’re going to celebrate Oktoberfest with a delicious “Three On A Roll.” Nüremberg is famous for its Nürnberger Bratwürst or Three on a Roll which are traditionally grilled over a charcoal or beechwood grill and served three abreast on a bun with mustard. 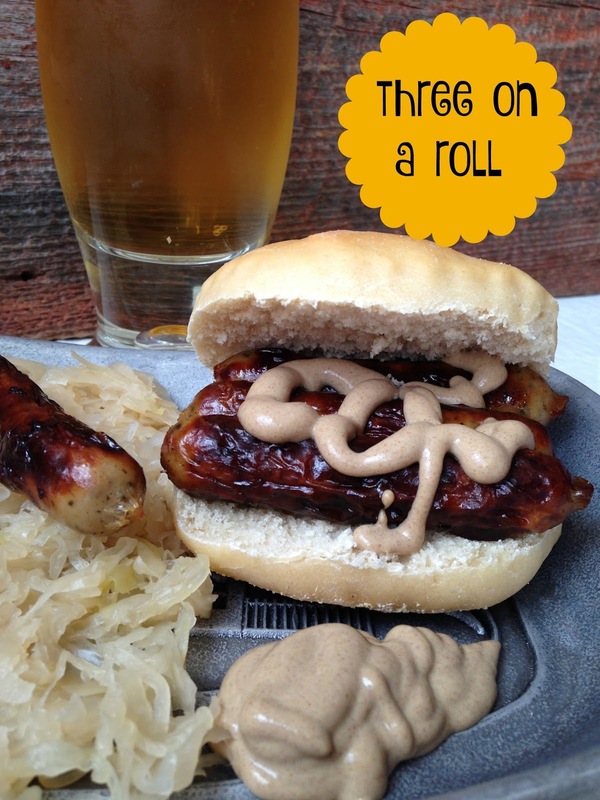 Whether served Drei im Weggla (three in a roll) or served on a pewter bell or heart-shaped plate with sauerkraut or with German potato salad. Nürnberger Bratwürst is among the most popular snack “fast” food in Germany. There are many restaurants in Nüremberg that specialize in the Nürnberger Bratwürst. It’s also common to see them being sold as a snack at markets and street stalls by street vendors. Nürnberger bratwürst are very popular at festivals held throughout Germany. Especially during Oktoberfest and Christkindlmarket held during the holiday season. The guidelines governing a real Nurnberger sausage are very strict and here they are. Sausages must be made of low-fat pork, enclosed in a lamb skin casing that is twisted into 7-9 cm long sausages, each weighing between 20 and 25 grams. The meat is seasoned with a touch of majoram which most people feel are what gives these little sausages their distinctive flavor. I happen to agree. Finally, the bratwürst has to have been made within the city boundaries of Nüremberg, to be able to call itself a real “Nürnberger Bratwürste” and “Nürnberger Rostbratwürste” A name that has been trade-mark protected worldwide since 2003 by EU legislation and that has designated the Nürnberger Bratwürst part of Bavaria’s culinary heritage. The Nürnberger Bratwürst is believed to be one of the most popular bratwürst in Germany. Each year around 800 million sausages are produced and sold all over the world. 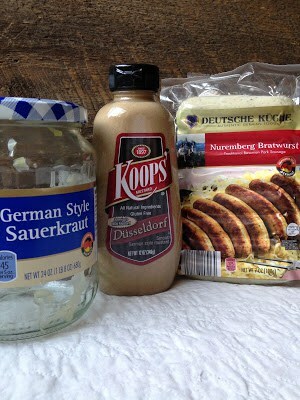 If you encounter a package of Nüremberg Rostbratwürste somewhere and aren’t sure if they are original or not, check the label. The original bratwürst carry a red-white seal with the Nüremberg castle on it. Nüremberg (Nürnberg) is said to be “The sizzling sausage center of Germany” Sausages such as: Thüinger, Nürnberger, Sonneberger, Coburger, Fränkische, Kulmbacher, Hofer, Westfälische, Nordhessische, Pfälzer, Rote Wurst, Schlesische, and Würzburger Bratwurst are among a few of the sizzling sausages found in Germany. Nürnberger Bratwürst are served in a variety of ways: 6, 8, 10, or 12 original “Nürnberger Rostbratwürste” are grilled and served with horseradish and sauerkraut or potato salad. “Blaue Zipfel” are served in an onion and vinegar sauce. “Weckla” are served three in a bread roll with mustard. 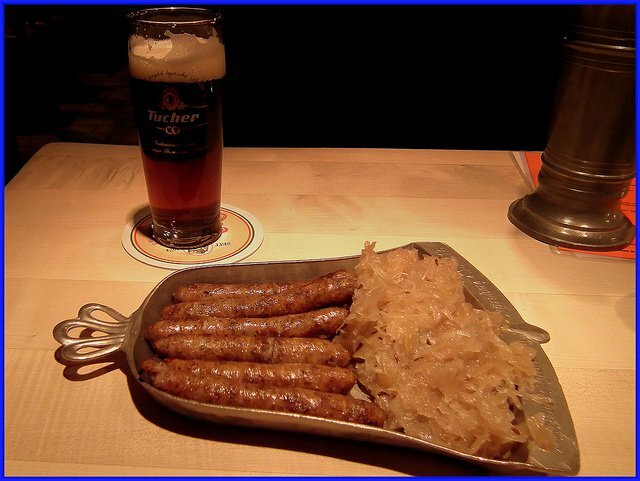 “Gehäckweckla” a pair of sausage served with raw onions or you can enjoy just a single sausage on a fork. Although the Nürnberger Bratwürst can be fried in a pan they taste the best fresh off a beechwood fire-grill. They are typically served with sauerkraut, a hearty German bread or enjoyed with potato salad, a soft pretzel, horseradish and mustard. 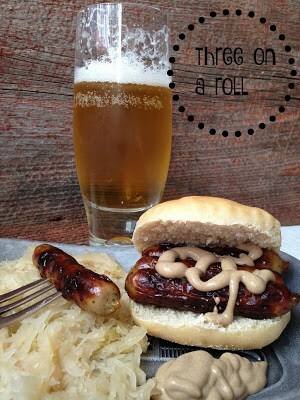 They are served in sets of 6 or 12 and best served with a German Bier. German Beer (Weihenstephaner Hefe Weissbier). Grill bratwürst on a gas grill or in a frying pan until golden brown. Warm sauerkraut in a small saucepan. Make sourdough kaiser rolls or purchase rolls. 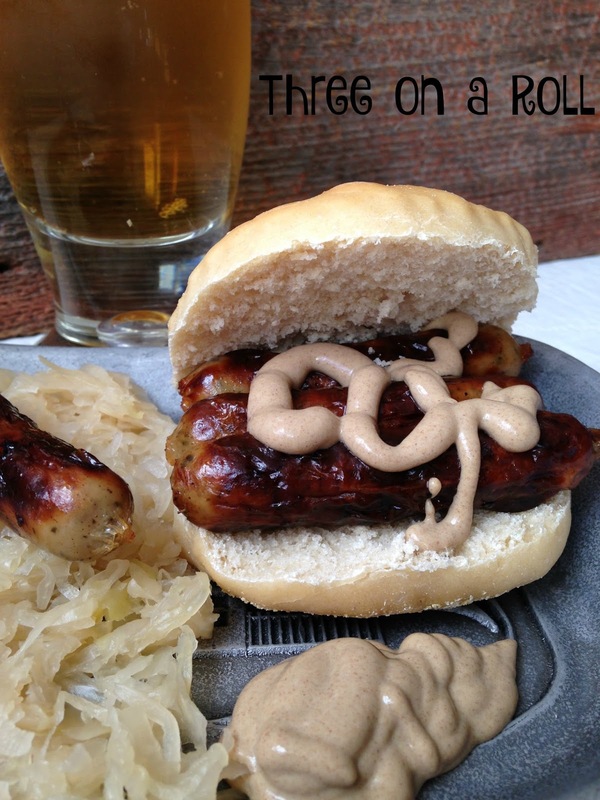 Place bratwürst on sourdough roll, top with mustard. Frankfurt is the home to the famous Frankfurter or otherwise known as the hot dog or wiener. References say that dachshund sausages and hot dogs can be traced to German immigrants in the 1800’s.German immigrants brought not only sausages with them in the late 1800’s, but also dachshund dogs. Several jokes no doubt were made about the Germans’ small, long, thin dogs, that resembled of course, the wiener dog. In a medium saucepan, heat sauerkraut on medium low. Grill frankfurters on a gas grill until golden brown. 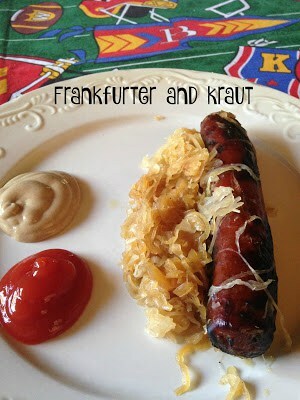 Place franks in saucepan with kraut and simmer for 1 hour. 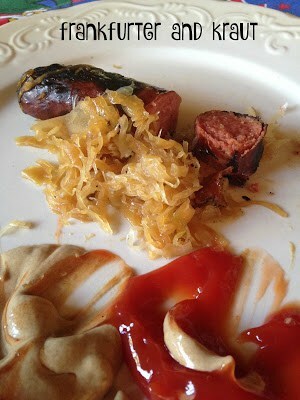 Serve franks on a plate with kraut, mustard and ketchup if using.